“I never expected this building to be so dangerous,” said Tenzin Paljor (above). Standing in the crumbled remains of a weaving hall, the secretary of the Jawalakhel Handicraft Centre looks dejected. 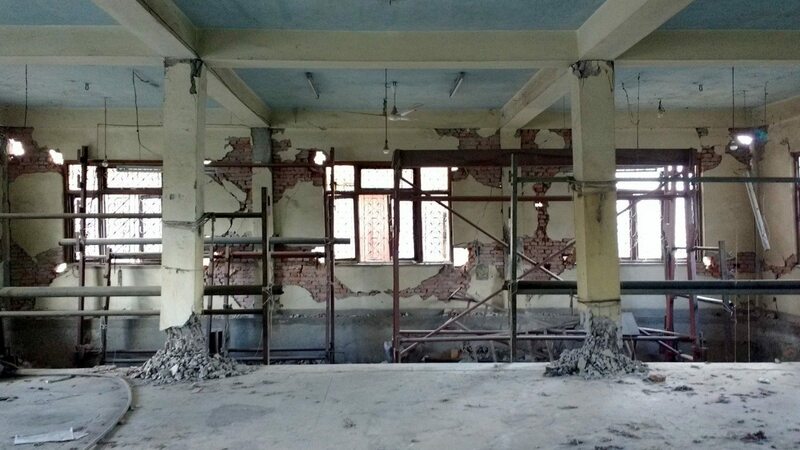 The centre, which has played a pivotal role in the lives of the Tibetan refugees living next to it, is now unusable. We had stumbled upon the centre walking through Kathmandu in an effort to avoid travelling on the overcrowded buses. Rows of Tibetan prayer flags billowing in the breeze told us there was a Tibetan settlement close by. On entering a large compound, we realised we had walked straight into the centre we had read about before coming to Nepal. From the outside, despite the deep cracks creeping across the walls, the building appeared intact. But once you entered, the scene changed. The main centre, which used to be thrumming with industrious Tibetan weavers, is now a striking reflection of the devastation caused by the quake. Our footsteps echoed in the deserted building. Rows and rows of broken pillars greeted us, many of which had sunk into the ground. Everywhere we look, we could see red brickwork under exposed patches of plaster—some bricks missing, others surrounded by webs of cracks. 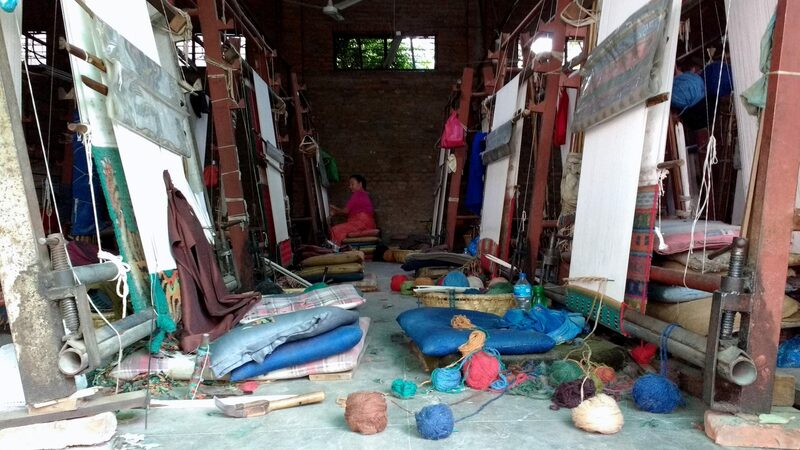 The remnants of the thriving weaving hall could be seen in the forms of tattered yarn, balls of threads lying here and there, and tall weaving machines, now abandoned. Outside, we met Choezin, a store manager who has been working at the centre for more than 15 years. She recalled the first time she saw the centre after the earthquake. “Those two months, living in the tents pitched on our football ground, and then coming back to the weaving centre to see it broken down, felt like being in a nightmare I had not woken up from,” she said. Choezin lives in the refugee settlement next to the centre, which is home to around 780 first- and second-generation Tibetans. In 1959, around 30,000 Tibetans fled to India, Nepal and Bhutan along with His Holiness the Dalai Lama, following the Chinese occupation in Tibet. This meant that the Tibetans had to start their lives all over again in a new land. 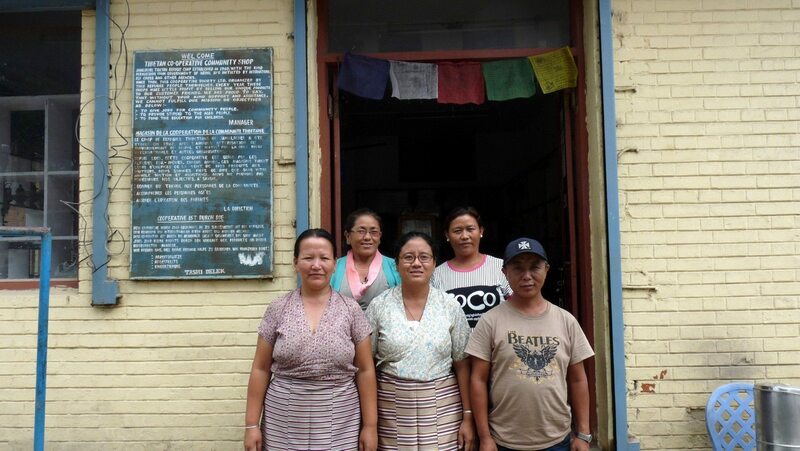 “The first 300 to 400 Tibetans who arrived in Nepal by 1960 lived in the Jawalakhel camp, which was funded by foreign aid and relief programmes,” said Paljor. “In 1961, with the help of the Swiss Agency for Development and Cooperation and the International Red Cross Society, we built the Jawalakhel Handicraft Centre.” The centre allowed the Tibetans to retain their identity and culture, and served as an economic avenue to sustain the community organically. The carpet business was a big success. The JHC introduced this unique craft to Nepal and it also became famous elsewhere in the world. As Paljor showed us around the camp, he told us that the weaving has always been exclusive and of top quality, with products ranging from 60 and 100 knots carpets, shawls, pashminas and handicraft items. For decades now, the centre has been weaving exquisite carpets using time-honoured Tibetan designs as well as fresh contemporary patterns. The intricate carpets come in dark hues, muted pastels, earthy ochres and enduring neutrals adorned with traditional iconography like the endless knot, mandalas and the Tibetan landscape. Despite the economic crunch faced by the centre in the recent years, it provides free education to the children, a kindergarten for the younger kids, support to the elderly people and handicapped, and medical assistance and housing to those who do not have homes. There are now 60 women weavers along with administrative staff, store managers, salesmen, and packaging units at the centre. Even though the centre was not functional for two-and-a-half months, it still paid minimum wages to the workers during that time. According to their estimates, it will take three to four months just to demolish the buildings and around NPR 90 million (around £560,000) to rebuild it. The thought of raising this amount is an overwhelming one, especially as the community has little means of raising funds to cover the entire cost, given their status in the country. While the Nepalese government treated Tibetans who arrived in Nepal before 1989 as refugees, those who arrived more recently have no legal status here. They cannot own property, be legally employed, pursue higher education, carry a refugee card, or have a passport. Because of its economic dependency on China, Nepal has come under political pressure from Beijing to restrain Tibetan activity—which has placed a huge humanitarian and economic burden on this community. After the earthquake, and with no legal status, Tibetans are not ‘eligible’ for any compensation—nor have they received any from the government. In such a scenario, it is next to impossible for the centre to raise funds on its own. Paljor said all they have managed so far are a few private donations of small amounts.